This image is a 3-D model of the trench excavated by the Mars Exploration Rover Opportunity. 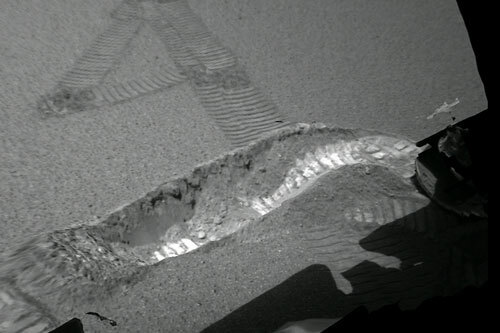 NASA's Mars Exploration Rover Opportunity has scooped a trench with one of its wheels to reveal what is below the surface of a selected patch of soil. "Yesterday we dug a nice big hole on Mars," said Jeffrey Biesiadecki, a rover planner at NASA's Jet Propulsion Laboratory, Pasadena, Calif. The rover alternately pushed soil forward and backward out of the trench with its right front wheel while other wheels held the rover in place. The rover turned slightly between bouts of digging to widen the hole. "We took a patient, gentle approach to digging," Biesiadecki said. The process lasted 22 minutes. The resulting trench -- the first dug by either Mars Exploration Rover -- is about 50 centimeters (20 inches) long and 10 centimeters (4 inches) deep. "It came out deeper than I expected," said Dr. Rob Sullivan of Cornell University, Ithaca, N.Y., a science-team member who worked closely with engineers to plan the digging. Two features that caught scientists' attention were the clotty texture of soil in the upper wall of the trench and the brightness of soil on the trench floor, Sullivan said. Researchers look forward to getting more information from observations of the trench planned during the next two or three days using the rover's full set of science instruments. Opportunity's twin rover, Spirit, drove 21.6 meters closer to its target destination of a crater nicknamed "Bonneville" overnight Monday to Tuesday. It has now rolled a total of 108 meters (354 feet) since leaving its lander 34 days ago, surpassing the total distance driven by the Mars Pathfinder mission's Sojourner rover in 1997. Spirit has also begun using a transmission rate of 256 kilobits per second, double its previous best, said JPL's Richard Cook. Cook became project manager for the Mars Exploration Rover Project today when the former manager, Peter Theisinger, switched to manage NASA's Mars Science Laboratory Project, in development for a 2009 launch. Spirit's drive toward "Bonneville" is based on expectations that the impact that created the crater "would have overturned the stratigraphy and exposed it for our viewing pleasure," said Dr. Ray Arvidson of Washington University in St. Louis, deputy principal investigator for the rovers' science instruments. That stratigraphy, or arrangement of rock layers, could hold clues to the mission's overriding question -- whether the past environment in the region of Mars where Spirit landed was ever persistently wet and possibly suitable for sustaining life. Both rovers have returned striking new pictures in recent days. Microscope images of soil along Spirit's path reveal smoothly rounded pebbles. Views from both rovers' navigation cameras looking back toward their now-empty landers show the wheel tracks of the rovers’ travels since leaving the landers. Each martian day, or "sol" lasts about 40 minutes longer than an Earth day. Opportunity begins its 25th sol on Mars at 10:59 p.m. Tuesday, PST. Spirit begins its 46th sol on Mars at 11:17 a.m. Wednesday, Pacific Standard Time. The two rovers are halfway around Mars from each other. JPL, a division of the California Institute of Technology in Pasadena, manages the Mars Exploration Rover project for NASA's Office of Space Science, Washington, D.C. Images and additional information about the project are available from JPL at http://marsrovers.jpl.nasa.gov and from Cornell University at http://athena.cornell.edu .